ENCINITAS – After the fall, life was markedly different for the couple. The humor, love and joy were all still there, but for the last three years of their relationship it was marred by hospital stays, rehabilitation efforts and the sight of a loved one connected to all sorts of medical machinery. Three years ago, Katherine “Kat” Wilson had suffered a subdural hematoma after falling. Veins ruptured in her head, causing blood to put pressure on her brain. More than 20 years before that, Kat and Tom Whayne met during a docent training session at the La Jolla Museum of Contemporary Art where the two would become volunteers. “I’m sitting there listening and here comes this woman,” said Whayne. “It was just a connection and it worked out beautifully,” he said. It seemed like an unlikely connection – Kat was a stone republican and Whayne, a left-wing democrat that would cancel each other’s votes out. But they had plenty in common. They reveled over an Ellsworth Kelly painting at the museum, and they both loved poetry. Hardly could it be known that the last few years of their relationship would eventually become the subject of a series of poems Whayne would write. A trio of poems, documenting the three phases of what had happened to Kat beginning with the fall, to her rehab, to what life was like only a month before her death were a part of about 25 poems that Whayne wrote during that time. Earlier this year, Whayne was invited to read his three poems in New York at a Narrative Medicine event. Narrative Medicine is prose or poetry that describes a person in a hospital room, a person who is a caregiver, a person who is in a nursing home; all of the surrounding details of illness, Whayne explained. “It’s not related to scientific medicine; it’s related to people’s feelings,” he said. The Intima, an online journal, is a student-created entity of the Narrative Medicine Master’s Program at Columbia University. The goal of Narrative Medicine is to help enhance communication and understanding between health care givers and their patients, according to its website. Whayne, a drama teacher in Oakland during the ‘60s, studied English Literature at Stanford University as an undergrad with poet Yvor Winters, who, Whayne said, didn’t like his poetry. But writing the poetry these past few years was a helpful way for him to cope, he said. “The way it would work,” he said, “Kat would sleep a lot and we would have dinner…and then we always would, I wouldn’t look at them now for a million bucks, (watch) Wheel of Fortune and Jeopardy! “We would both get in bed and Kat, she couldn’t answer the questions on Jeopardy!, but she liked to watch it. But her mind was not affected in such a way she could solve the word problems on Wheel of Fortune. So the two of us would sit there, two old farts, and we would watch these two programs. Then, when they were over, the caregiver, and we had a caregiver for all the three years, would start getting her ready for bed. As time went on, Whayne would take Kat to the museum to look at the Kelley painting. Her lack of interest in the painting, the big wash of red, blue and green watercolor paints that drove the docents crazy whenever anyone, especially children, got too close to it, signaled to him, he said, that she didn’t want to live anymore. What is she dying of? What is she failing with? Whayne would ask the doctor. “And the doctor looked at me and went, ‘I don’t know, but here, we say frailty.’ And that was how they described her passing,” Whayne said. She was 89 years old. Whayne said he would make one last visit to their now empty Pacific Beach home, where the couple lived up until earlier this year. “It may be pure sentimentality – maudlin sentimentality, I don’t know, but I’m going to do it. 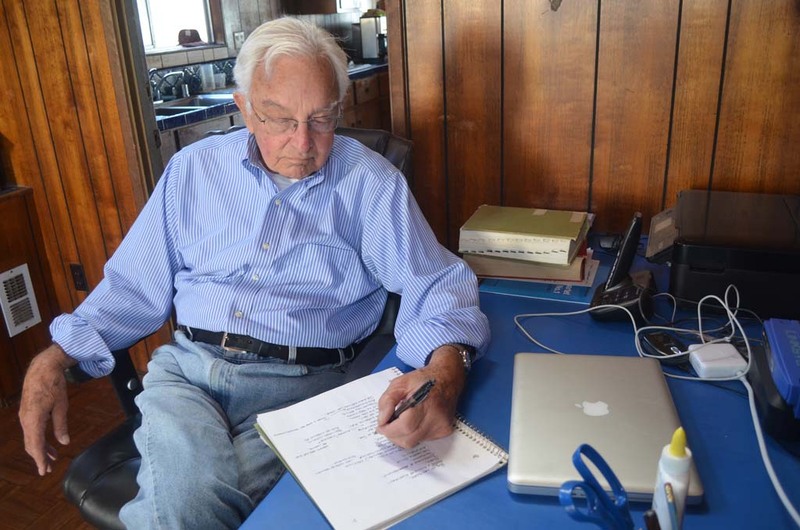 He continues to write today, though now it’s back at his Leucadia home. He still remembers the first poem he was driven to write, seeing her under all the wires and things and his kissing her and then the realization. “And it was just a poetic feeling,” he said.